Nowadays there can be many different hotels found with wide verity of services provided. When it comes to booking the hotel, it is very important for the client to easily find a hotel that is appropriate for his needs and conform the requirements for quality. That’s why there is rating systems introduced. Hotel ratings are used to classify all the hotels by the quality. These ratings clearly can show the client if the hotel is appropriate for him or not. Each rating includes requirements for specific facilities. However, there are some rating systems that focus more on overall quality not specific facilities and services. There is wide verity of rating or classification systems. Usually they are created by some hotel associations or other organizations that are related to accommodation or tourism in general, but some countries also have their own rating systems. The most common ones that are used almost in any country and of which most of the people are aware of are star rating system and A to F rating system, but you should be careful with them, because they can have different meanings in different countries. There is no international classification system. There have been attempts to create one, but they were all unsuccessful. The most popular classification is the one created by European Hotelstars Union. It is used in most of the European courtiers which are members of this union. However countries outside Europe are not part of this system, most of the countries still use quite similar standards of classifications. European Hotelstars Union classification system provides rating from one star to five stars with superior class of each rating. One star represents Tourist hotels. For a hotel to be rated as one star hotel it must provide WC and shower or bath in each room, daily cleaning, TV in the room, table and chairs in the room, soap and body wash, breakfast included and possibility of catering provided. One star superior hotel provides the same facilities, but it is a little bit better in some ways, so they are closer to two star hotels. There are superior versions of other categories as well and there are the same requirements for them. Two star or standard hotel must provide all the facilities that one star hotel must provide and also buffet type breakfast, lights next to bed, high quality body wash and other sanitary products, towels and sheets from natural materials. Three star or comfort hotels must provide all the facilities that one and two star hotels must provide and also reception which is opened at least 14 hours a day, luggage services, room service, telephone in each room, internet access, mirror, hair dryer and tissues in the room, extra pillows and blankets. Four star or first class hotels must provide all the facilities that one, two and three star hotels must provide and also reception which is opened at least 18 hours a day, lobby, mini bar, cosmetic products and bath robe and restaurant in a hotel. And the five star or luxury hotel most provide everything mentioned above and also 24 hour reception, doorman service, concierge service, 24 hour room service, internet access in the room, safe in the room and high class services. Hotel is the most common type of accommodation so there is huge competition between all these institutions. 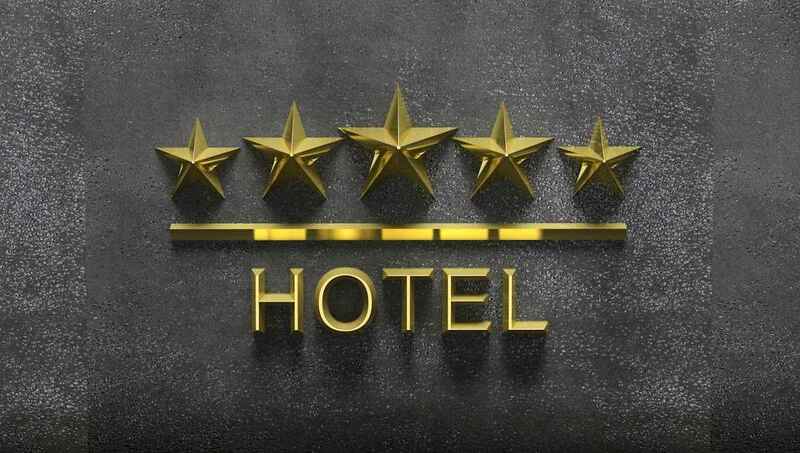 Even if the hotel provide high quality and is rated with five stars, that doesn’t make it one of the kind and clients will still has a chance to choose between many similar hotels. That is the reason why nowadays, hotel owners are trying to come up with something incredible, that other hotels can’t get. If you are tired of all the standard hotels, they might be perfect for you. Here is the list of specialty hotels. The first type is boutique hotels. Those are hotels which are located in historical buildings. They are somehow associated with important historical events or personalities. Also the interior and exterior of them are associated with history. Visitors choose these kinds of hotels not only because of the quality or provided services, but also the atmosphere and story that comes along with the building. The next type is cave hotels. Those are hotels those are located in real caves. In most cases the interior is made so the room wouldn’t look like typical cave. There are all the facilities provided, but the walls are actual, natural cave walls. Also these kind of hotels more focuses their image of the uniqueness and don’t think so much about ratings. Something similar to cave hotels are cliff hotels – located on the cliffs and the cliffs configurations are used as the base of hotel. Ice hotels are hotels made form real ice. Just few years ago there was only one ice hotel and it was considered as something very unusual, but now there are many. Almost in all the countries that are located above the polar Circle there is at least one ice hotel. They must be built every season. Ice hotels really look amazing, but they are cold and uncomfortable. None of them are able to get more than one star, but it doesn’t mean they can’t be considered as luxurious hotels. Tree house hotels also have become very popular. If look at the definitions, they are more similar to camping, but as there are different, high quality services provided they are being called hotels. Of course, they are not as comfortable as traditional hotels, but the saying in them can be an adventure itself. These kinds of hotels are especially popular in exotic countries to provide the authenticity. Underwater hotels also are nothing new, but staying in them is a very interesting and can give authentic experience. 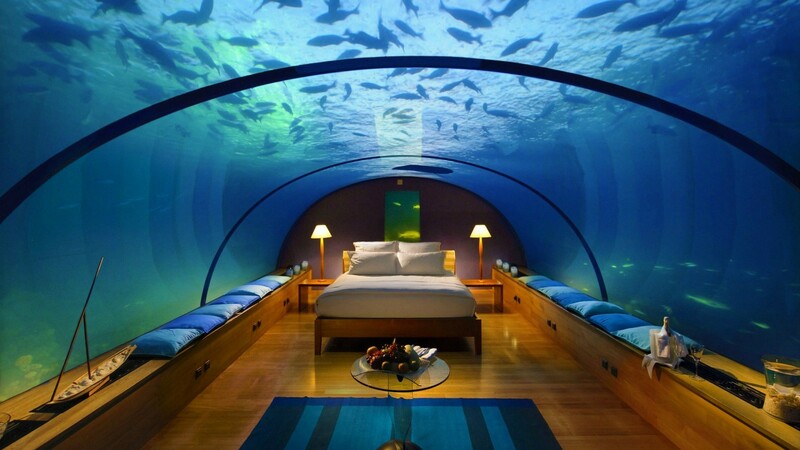 They are hotels that actually are built either under natural waters or artificial aquarium. These are not the only types of specialized hotels. There are also bunch of other types and even some hotels that really are one of a kind. Although these hotels can’t get high ratings, because of their unique design, they are still considered as very high quality hotels and in most cases they are even more expensive than five star hotels. When it comes to booking a hotel room, client should know everything about the room types to choose the appropriate one. Not knowing what exactly each term stands for may cause a lot of disagreements and problems so here is a list of most often used terms of hotel room types. Single room is a room with only one queen size (single) bed, which is meant for one person only. All the facilities also are meant for one person. Usually, beside bed, there is only one table and chair in the room. It has all the basic amenities, but the room is quite small and casual. It is the cheapest type of room in most of the hotels. The next room type is double room. There is one king size bed in double room, which is meant for two people. Also one person can stay in double room, but all the facilities are meant for two people. Double room is bigger than single room and also there is more furniture. Standard double rooms are also quite casual with no extras. Twin room is also meant for two people, but there are two queen size (single) beds in the room with separated headboards and table between the beds. All the other facilities and amentias are about the same as in double room. Triple room is meant for three people with three separated queen size (single) beds. All the facilities are meant for three people. Also furniture is adapted to this amount of people staying. Quad is a room meant for four people with four separated queen size (single) beds. Everything in the room is adapted for four people. Some hotels also offer rooms with more than four single beds, but usually four is maximum count of beds in one room. Some hotels also offer family rooms. 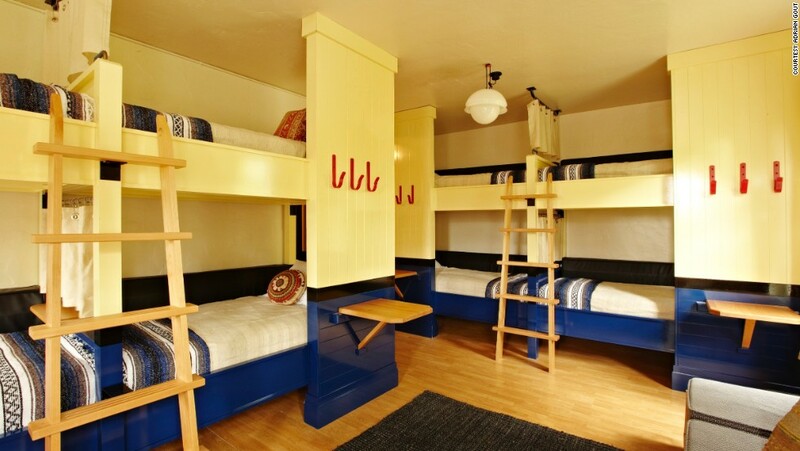 Usually family rooms have one double bed and one or two single beds, but there can also be different variants. The beds usually are sapareted either with furniture or folding screens. The facilities are adapted to the amount of people staying in the room. Deluxe room is a luxurious version of either single or double room. It is well furnished, bigger and with some extra amenities, for example, fridge in the room or bath instead of shower. Deluxe rooms are more comfortable, but also a lot more expensive. Studio room is single, twin or double bedroom with adjacent living room. The bed rooms are the same as typical single, twin or double rooms, but in the living room there is couch, coffee table and some chairs. Also the room can be equipped with small kitchen. Suite includes at least two bedrooms, living room and dining room with small kitchen. There can be lot of combinations, for example, two double rooms or one double and one single room. There can also be penthouse or president suite, which are very luxurious and expensive. And duplex room includes two separated bed rooms, in different floors. There can be also dining room, kitchen or living room added. Duplex rooms also have different variants available. If you are traveling to popular tourism destination, the choice of hotels probably will be huge. On one hand it is good, that travelers have a chance to choose from many hotels, but on the other hand it can be quite challenging to find the most appropriate hotel. If you are facing this problem, you can ease this task by following some simple steps. The best way how to choose a hotel is by checking booking sites. The bigger and most popular one is booking.com, where you can find all the biggest accommodations, but if you want you can use also other sites. So first you need to go to the site and write in the city or town, where you need to stay, exact dates for staying, count of people staying and count and types of rooms. Probably you will have a lot of offers so the first thing you need to do is sot the hotels by the price. If money is an issue for you, the best way is to set the price from the minimum that is offered on the site until maximum sum you can afford. If money is not a problem, you can either skip this step or look only for expensive hotels. Next thing you need to do is to filter hotels by the amenities you need. All booking sites should have amenity filters, if not, better choose another booking site. First check only the amenities that are most important for you for example parking lot, wifi, separated facilities etc. If there are still too many suitable offers, you can check also less important amenities. At the end you will have a short list of appropriate hotels. Then you need to check these hotels in the map. Location usually is one of the most important criteria when choosing hotel, so this is very important step. You need to think where exactly you would like to stay, for example, next to some tourist attractions, next to the airport etc. After this filtration, there should be only few hotels left. The last thing to do is check the websites and reviews of these few hotels. Then you will be able to see how each of them looks and what other costumers say about them. If there are lots of bad reviews, than better don’t choose the hotel, even if all the criteria match for your needs. Basically, it is most important to focus only on the things that matters for you. Lot of hotels is expensive only because of the extra amenities offered, but there is no need to pay, if you won’t use them. Also always check if the information provided is true, so you wouldn’t be disappointed in your choice. Booking an appropriate hotel is a significant aspect of a successful trip. Usually travelers are looking for comfortable hotels, because they need a place where to spend some quality time between all the adventures and tourism attractions, but in some cases the hotel can be a tourism attraction itself. We are talking about unique and even odd design hotels. These hotels are perfect for travelers who want to gain some unique experience. Here are some amazing design hotels that are not just a place where to spend a night, but are the one of the adventures of the trip. 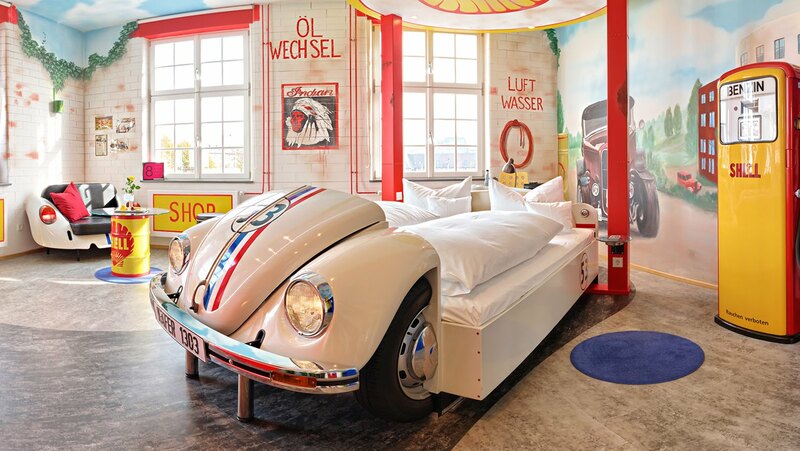 V8 Hotel in Stuttgart, Germany is every car lover dream. There you can spend a night in a bed that looks like classic car, for example, Cadillac, Mercedes-Benz or Toyota. These car beds are not made as cheap imitation of classic cars, but are authentic and look just like real cars, but that’s not all. There are also paintings of classic cars in each room. In this hotel you can get comfort and unique experience at the same time. The Manta Resort in Pemba Island, Tanzania is incredibly fantastic hotel. Basically it is inverted fish tank 250 meters off the coast of Ocean riff. That means guests are staying in an aquarium. They are able to watch fishes while lying in their beds. View is just amazing, and hotel room is very cozy. Hotel Kakslauttanen in Saariselka, Finland gives their gusts a chance to stay in comfortable igloo and watch Northern lights. Actually they are specially made for travelers, who want to see the Northern lights, but don’t want to sit outside for many hours. Each igloo has glass roof and they are designed to stay warm even when it’s less than -300 C. So this is a chance to turn your stay in a hotel into real adventure that only few have a chance to experience. The Museum Hotel in Cappadocia, Turkey is a cave hotel. Although cave hotels are not new and it is possible to find them all around the world, this one is special. It combines comfort, elegance and authenticity. Hotel really is made inside an original cave, but it looks more like a room in an antique castle. This is definitely a good choice for those who are looking for unique romance. Giraffe Manor in Nairobi, Kenya can give their guests best adventures than any zoo or safari park. Giraffe Manor itself is very elegant and sophisticated building, which offers their guests the best service, but beside that it is possible to see real giraffes there. Actually it is not only possible to see them, but also touch them and feed them. There is a big chance that giraffe will poke its neck through the window of the room and will show some interest about guests. Icehotel in Jukkasjärvi, Sweden is a hotel made of real ice. Nowadays there are ice hotels also in other locations, but this was the first one and also it is most beautiful one. Everything in a hotel is made of ice. Each year this hotel is being rebuilt, because, when the weather becomes warmer, it melts down. It is quite cold inside the room, but there is special outfit given to each guest.